Two sets of small satellites stand out: ones that reside in ring arcs or in whole rings: Methone, Aegeon, and Pallene (Hedman et al., 2009). 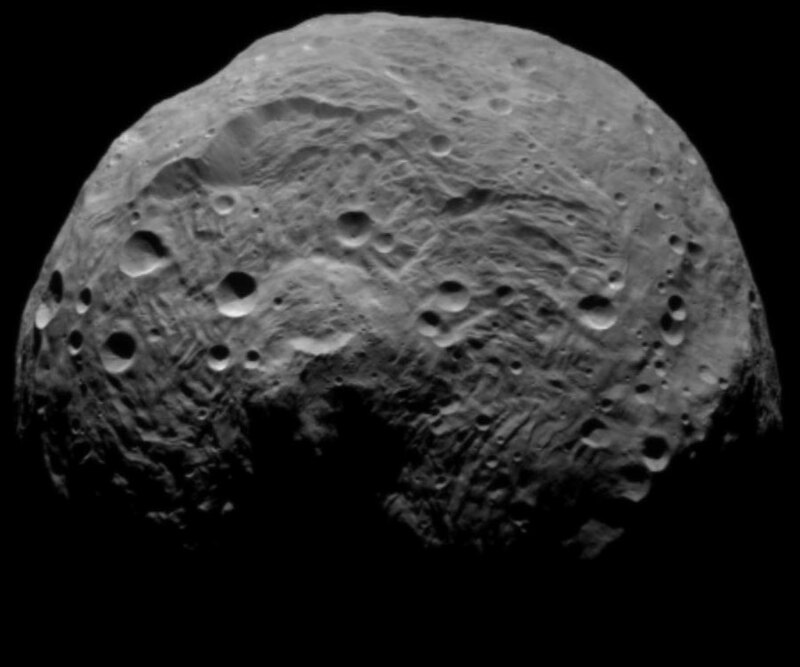 These are smooth, ellipsoidal shapes, unlike any other small objects so far imaged. 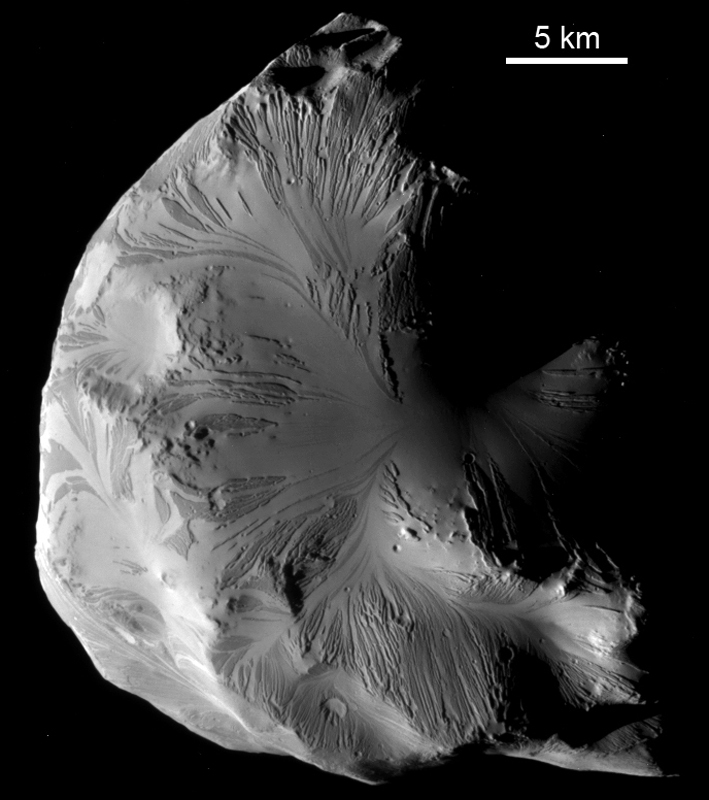 The smooth surface of Methone (Image 2) may have acted as a fluid on geologic times scales; if so, the mean density is indicated by the shape to be about 300 kg m-3. 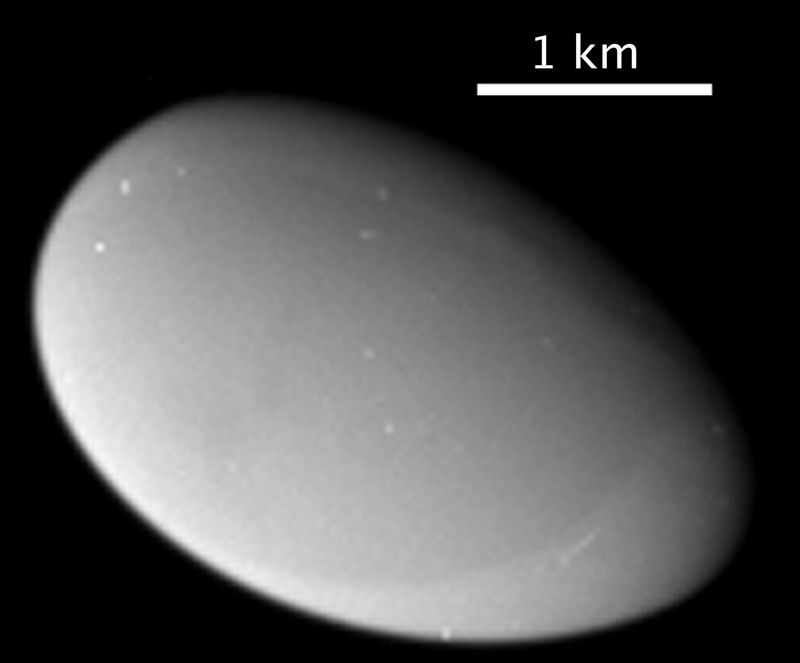 Other truly distinctive satellites are Helene, Calypso and Telesto, orbiting at the same distance as Tethys and Dione, the “Trojans.” These are distinguished by thick coverings of material that is subject to long-distance downslope transport (Image 1). The darker, higher residual mesas in Image 2 and the smoother surface of material moving downslope indicate a history of deposition followed by (ongoing?) erosion. Other images of this body indicate this is a nearly global characteristic. 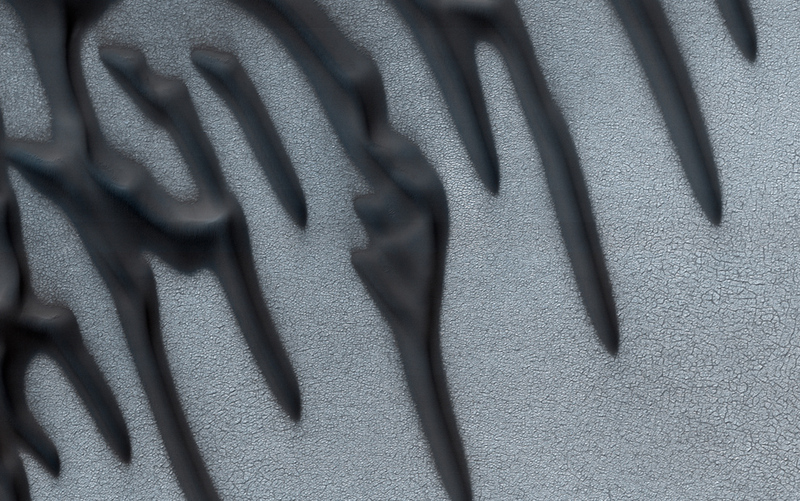 The mechanisms responsible for the smoothing and for transport of material across the surfaces of these objects are not known, though seismic shaking from impacts, electrostatic effects, or even thermal cycling might play roles. Image 2: Methone image N1716192103, phase angle is 63°, taken May 20, 2012. Buratti, B.J., et al., 2010. Cassini spectra and photometry 0.25-5.1 µm of the small inner satellites of Saturn. Icarus 206, 524-536. Castillo-Rogez, J.C., Johnson, T.V., Thomas,P. C., Choukroun, M., Matson,D.L., Lunine, J.I., 2012. 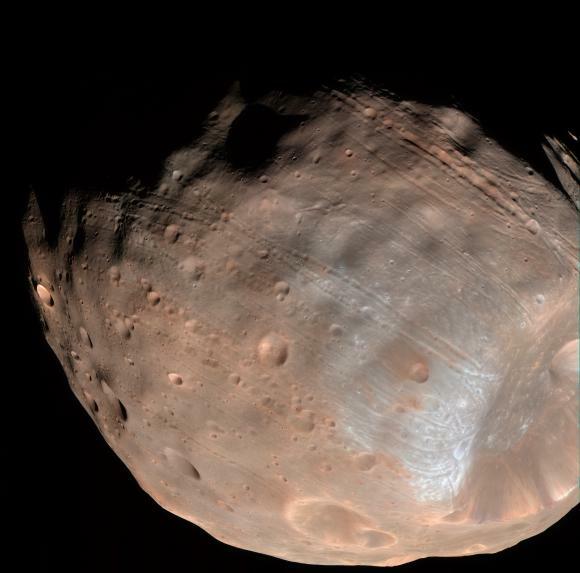 Geophysical evolution of Saturn’s satellite Phoebe, a large planetesimal in the outer solar system. Icarus 219, 86-109. Charnoz, S., Brahic, A., Thomas, P.C., Porco, C.C., 2007. The Equatorial Ridges of Pan and Atlas: Terminal Accretionary Ornaments? Science 318, 1622-1624. Hedman, M.M., Murray, C.D., Cooper, N.J., Tiscareno, M.S., Beurle, K., Evans, M.W., Burns, J.A., 2009. Three tenuous rings/arcs for three tiny moons. Icarus 199, 378-386. Porco, C.C., Thomas, P.C., Weiss, J.W., Richardson, D.C., 2007. Saturn’s Small Inner Satellites: Clues to Their Origins. Science 318, 1602. Thomas, P.C., 2010. Sizes, shapes, and derived properties of the saturnian satellites after the Cassini nominal mission. Icarus 208, 395-401.